For a trouble-free move to San Simeon, Meathead Movers is the company for you! Our professionally trained student-athlete movers are ready to get you into your new San Simeon home. 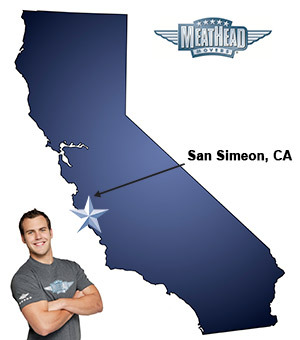 Welcome to Meathead Movers of San Simeon! If you are moving to or from anywhere in San Simeon, we are the moving company for you! Our professionally trained student-athlete movers and our moving concierge service are here to help you with every stage of your move in San Simeon. Located on the beautiful Central California Coast, San Simeon is a hidden gem that offers its visitors scenic coastal views and riveting architectural designs. With its temperate and moderate climate, there are endless opportunities for outdoor recreation. You can catch a glimpse of elephant seals at Piedras Blancas rookery, explore San Simeon State Park, and stroll along the beautiful California coast. You can also feel like royalty at the world-famous Hearst Castle. If you are considering a move to San Simeon, Meathead Movers is here to help. Our moving company specializes in local, long-distance, and commercial moves to, from, and within San Simeon. We also provide reliable packing, storage, on-site relocations, and our distinctive moving concierge service, which connects you with local service providers. All our student-athlete movers are thoroughly screened and trained before their first move. With branches not just in San Simeon, but all throughout California, we are your one-stop resource for all your moving needs, no matter where your California move takes you. In fact, you can see what your neighbors in San Simeon have to say about us. With our 100% satisfaction guarantee, the only thing you have to lose is the stress that comes from moving! So contact us today for a free no-obligation moving quote and to learn how we can help you on your next move! Moving to San Simeon? Here are some helpful resources. View more San Simeon resources. Great communications,all schedules met.great people and great people skills.look forward to our return trip. They were very friendly, efficient, and courteous. The professionalism of office staff, estimator and movers were incredible. The student athlete movers were so quick and efficient. They started sooner than anticipated and finished in an unbelievably quick time. They packed, moved and unloaded in the storage unit!! What a great company and what great staff. San Luis Obispo County is very lucky to have MeatHead movers!!! !